If you’re looking for a healthier way to commute, consider Bike & Ride with Transport Canberra. You can ride your bike and store it or bring it aboard as your continue your journey on a bus or light rail vehicle. Find our Bike & Ride locations and see which of the below options will best suit your multi-modal travel needs by viewing our Bike & Ride Map. Take your bike on the light rail, securing it using the bike rack within the passenger area. By choosing to Bike & Ride, you’ll be helping to reduce congestion, reduce energy consumption and pollution, and make Canberra a cleaner and greener place to live today and into the future. Plan your journey or find out more about the health benefits of active travel. Park & Pedal is another convenient option for using active travel for your commute. All Bike & Ride facilities are marked on the Bike & Ride map (PDF 1.6MB). 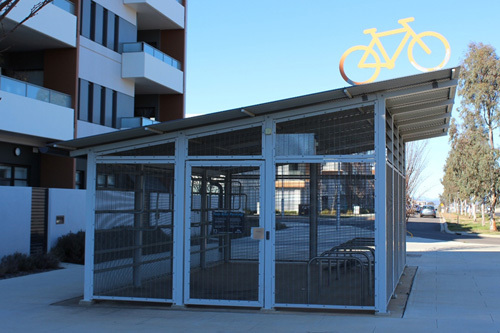 Apply for access to a secure, sheltered bike cage by emailing myway@act.gov.au with your MyWay card number and the location of the cage you would like to use. Access will be granted within 5 business days. Once access has been granted, simply swipe your MyWay card to open the door and place your bike on one of the racks inside. Apply for access to available lockers using the bike locker application form (PDF 40KB) / Word version (69KB). Terms and conditions are listed on the form. You’ll be placed on a waiting list and notified when a locker becomes available. Lockers must be reserved prior to use, and you’ll need your own padlock to ensure the locker remains secure. 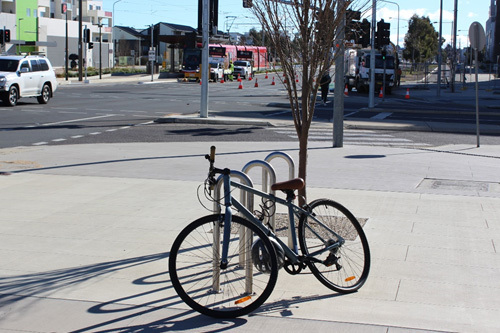 Bike rails are installed at over 15 bus stop locations across Canberra, primarily on Rapid routes. Bike rails can be used without reservation, and are available on a first come, first served basis. Bring your own lock to secure bikes at these open facilities. ensuring bikes do not touch each other or the bus, assuring safe, secure transport. 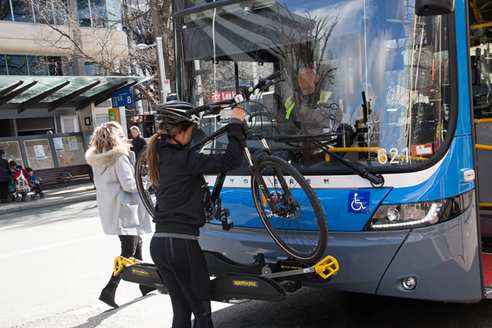 Bike racks on buses cannot be reserved and are available on a first come, first served basis. No lock is required when using the on-bus bike rack. Pay your normal fare to take your bike on the rack. You can also download the Using the bike rack (PDF 156 KB) instructions. children aged 13 or under must be assisted by an adult to load and unload the bike. you close and secure the rack if your bike is the last one on the rack. Please report any damage or faulty operation of the rack immediately to the bus driver. Bikes can be carried on light rail and must board through either of the double doors, which are clearly marked with a bicycle image. All bikes must be placed into the allocated bicycle rack which is clearly marked on the LRV floor. The racks are designed to accommodate two-wheel, single-seat bikes. A maximum of four bike racks are available and cannot be reserved, spaces are on a first come first served basis. For more on bicycle access for light rail, download the CMET Bicycle Access brochure. you take full responsibility – Transport Canberra is not liable for any damage, wear and tear, loss or stolen bikes. Transport staff may refuse carriage of a fold-up bike if they deem it to be an inconvenience or danger to someone else, and for safety reasons the bus driver is not able to assist with the carriage, loading or removal of a bike on or off the bus. Read our Bikes on Buses Policy (PDF 132KB). Find out more about cycling in Canberra.